In my debates with some theists over the nature of human morality I am sometimes accused of being utopian. Of only seeing a good side to human nature. Ignoring the history of violence and persecution. Maybe it’s just a matter of my critics finding a balanced view of human nature impossible. However, I reject their criticism because I have in fact written about the human nature and intuitions, such as the “then vs us” intuition, which have motivated negative examples of human activity. Still, these critiques have put me in admirable company – Steven Pinker has received similar unwarranted criticism. 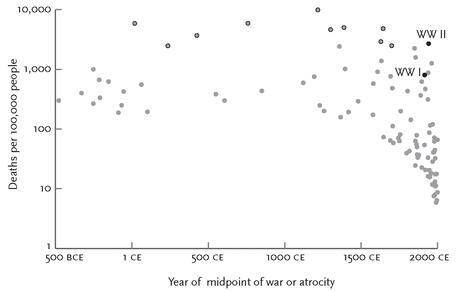 Particularly in the publicity surrounding his new book: The Better Angels of Our Nature: Why Violence Has Declined. I have a copy and look forward to reading it. His earlier books are impressive and this has certainly had excellent reviews . Pinker argues, and provides evidence for his argument, that human violence has declined. He is not claiming this trend is inevitable or that it cannot be reversed. Just that it is a fact of recent history. The Guardian recently published an interview with Pinker about his findings. You can read it at Steven Pinker: fighting talk from the prophet of peace. This included a table from the book that impressed me. it was a list of the 21 worst atrocities (conflicts or tyrannies) in human history. Pinker recalibrated these, to express the number of victims in terms of an equivalent 20th Century population. I have listed the data below in order of the recalibrated death tolls. It certainly provides some food for thought. (And, incidentally put’s paid to the simplistic ideologies which blame all wars and atrocities on either religion or atheism). One of the figures from Pinker’s new book also illustrates his main point. This is his Figure 5.3: 100 worst wars and atrocities in human history. Perhaps we are getting better? certainly a fascinating table. However, open to issues with selection bias (not Pinker’s fault) because of possible lack of reporting of smaller conflicts in the historical record. Also what about introducing medical care as a covariate? That may change things. I wonder too about a deaths against global population as a measure of violence. I can think of others – eg # of conflicts between city states/countries. Hard to say what is best. Anyway, if violence between countries is diminishing it is a good thing and perhaps says something about either the spread of modern democracy and/or the fear engendered by modern weaponary. Yes, Kiwiski, – Pinker discusses the limitations of the data in his book. I have often thought ideological reasons cause us to inflate deaths due to Stalin (eg including famine, civil wars,etc). Actual deaths due to direct terror were lower. Similarly we would get inflated figures for the inquistions and relgious wars if deaths due to the black plague were included. He also discusses the problem of bias due to recording and coverage. There is much more coverage and recording of todays conflicts than there were of ancient conflicts. I imagine he may have even underestimated the proportion of ancient conflicts.